for devices and accessories into one frame. Currently, it’s the fifth-most funded Kickstarter in the history of the site. On Tuesday, the company announced its second campaign, and it’s taking a more tech-focused approach along with it. 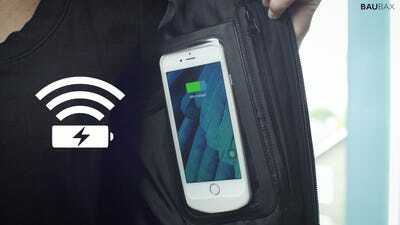 Its new line of “Wireless Charging Apparel” consists of clothes, wallets, handbags, and device accessories that, as the name suggests, are all designed to make your outfits double as wireless charging bases. So, it’s a bit different. Let’s take a closer look. At its core, Baubax is still selling clothes, so it's got a range of outerwear for both men and women, along with a few pairs of men's pants and shorts. 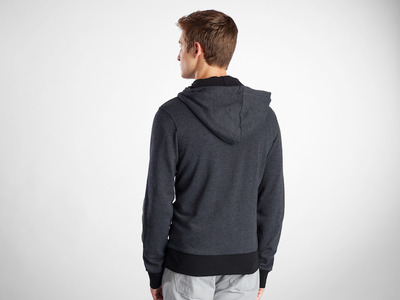 This is one of its sweatshirts, for instance. 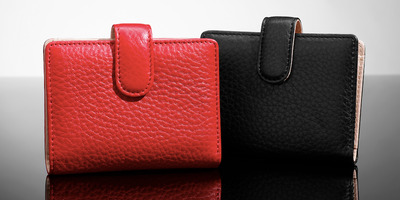 You can see a full listing on the company's online store, but alongside the jackets, vests, and so forth, there's also a handful of wallets and wristlets. I'm far from a fashion expert, so I'll leave for you to decide whether or not all this suits your style. After a brief hands-on (or body-on), though, I will say that the men's vests and jackets didn't come off as cheaply put together. 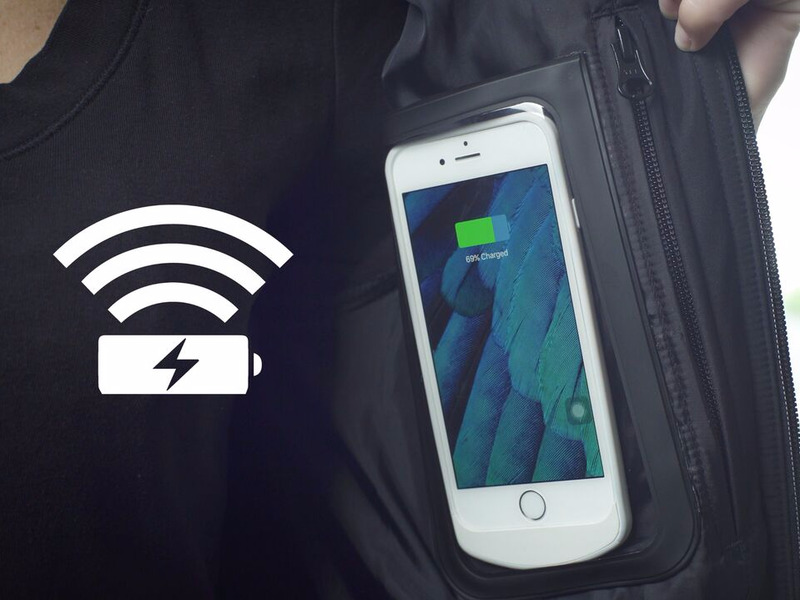 Inside that outerwear are tiny wireless charging pads. 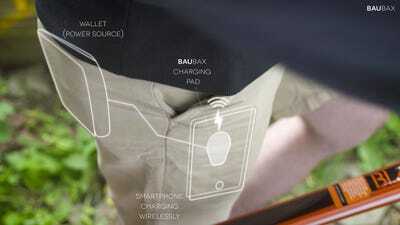 Those connect to a small battery bank, which can be stashed separately or within one of Baubax's wallets. This is what allows the charging to work. That portable battery holds 4,000mAh of power on its own. That's not a ton, so you'll likely want to recharge it (over microUSB) after every phone refill. Baubax CEO Hiral Sanghavi did say the company is still planning to refine the pack before launch, though. Baubax also says those charging pads are machine washable, so you shouldn't have any reason to fear your washing machine here. 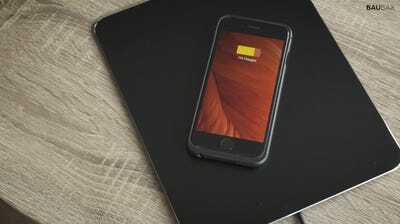 On a base level, Baubax isn't doing anything different than any other wireless charging solution. There's a pad, a power source, and a compatible device. The difference is that the cables that connect all of this are integrated into the apparel. While my demo wasn't extensive, everything did work. I slid a case-covered iPhone into the pocket of a vest like the one above, and it started powering up a few seconds later. The natural worry is that things could come loose if you move too wildly, but, outside of making sure you insert the phone the right way, nothing about it felt particularly unnatural. Everything here uses the Qi wireless charging standard. 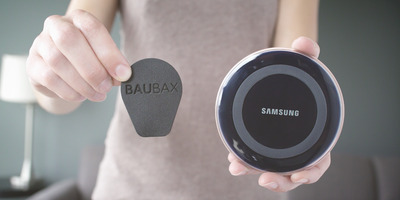 Baubax's wireless charging pad on the left, a Samsung Qi charger on the right. That's still the most popular of the few that are out there, with native support from Samsung's Galaxy phones among other Android devices. Per usual, though, iPhone owners will have to pay up for a Qi-compatible case to get any of this to work. 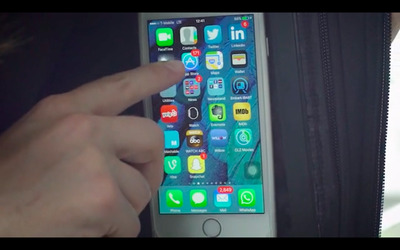 Baubax is selling its own versions of those for the 6, 6s, 6 Plus, 6s Plus, SE, 5s, 5, and 5c. The company says it will launch a new model when the next iPhone inevitably launches later this year. For smartwatch owners, there's a separate charging coin that slides out from under your sleeve and sits on your wrist. Baubax has models for Apple and non-Apple smartwatches, though it says the former won't be ready for pre-order until October. Sanghavi says the charging pads will be capped at a certain temperature to prevent the device on your person from getting uncomfortably hot. Specifically, he mentioned that nothing would go above 40 degrees Celsius -- your device will keep charging after that, but it won't go any faster. Considering how wireless charging tends to be fairly slow to begin with, you're really trading efficiency for convenience here. ...as well as both wired and fully wireless Bluetooth earbuds. 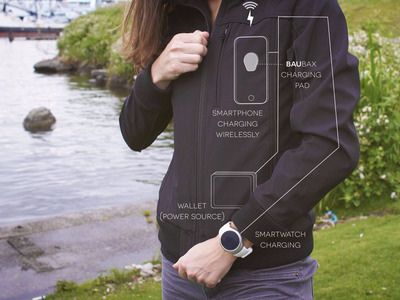 I wasn't able to take a listen to either of those, but both can be charged on the battery pack, or, as seen above, through slots on the collar of Baubax's jackets. Again, the company says those wireless earphones aren't ready for pre-orders just yet. It's hoping for a December launch there. Baubax had notable issues with shipping delays after its first campaign, but Sanghavi told Tech Insider that the company is working with new distributors and setting up seven warehouses around the globe to better handle demand. If there's a hangup here, it could be cost. The apparel ranges from $70 (for the chino shorts) to $170 (for the bomber jackets). The battery bank goes for $49, while the charging pad is $29. A couple of Baubax's wallets, which double as battery bank holders. All of those are the 'super early bird' prices for Kickstarter backers, too, so they will all go up as Baubax gets closer to a full launch. Still, if everything works, it's not hard to see the convenience of charging your phone just by putting it in a pocket. Baubax is asking for $100,000 for the campaign, and hopes to having everything shipped by January 2017.